Shearings Group take delivery of 38 Mercedes-Benz Tourismo coaches this month in the largest ever Tourismo order for the UK. The Group has previously bought Setra coaches, but since Euro 6 these are no longer available in the UK. The order comprises 23 Tourismo 12m coaches for National Holidays livery and 15 Tourismo 13m coaches in Shearings Holidays livery. 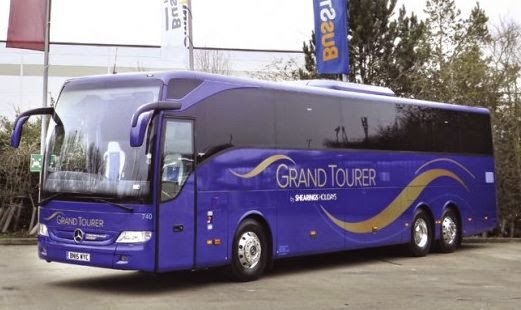 The previous gold-and-brown Grand Tourer livery is dropped in favour of Shearings blue with gold. The National Holidays white-based livery is unchanged. All vehicles are leased and the first examples have gone on the road this week. Shearings Group CEO Denis Wormwell said “This represents a significant investment for us, close to £10m. Working with the team at EvoBus UK and Mercedes-Benz Financial Services we have been able to tailor a package specifically for our business. Adds General Manager Mercedes-Benz Coach Sales UK, Jonathan Prime: “It is a pleasure to work with business partners who put customer satisfaction at the heart of everything they do. These new vehicles, says Shearings, offer “maximum comfort with stylish upholstery,” generous legroom, individual overhead service controls, full air-conditioning, and arm and footrests. Shearings have a special section of their website here for coach enthusiasts. This contains a fleet list but so far it hasn't been updated to include the new vehicles.